Fingerprints and toe prints begin. 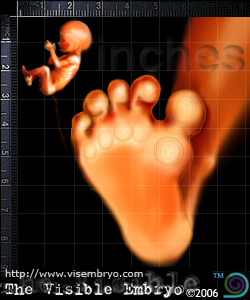 LENGTH: The crown-to-rump length of the fetus is about 4.3 to 4.6 inches (108 to 111mm). WEIGHT: About 2.8 ounces (80g). MOTHER"S SIZE: Uterus weighs about 8.75 ounces (250g). The amount of amniotic fluid around the baby is about 7.5 ounces (250ml). Top of uterus can be felt about 3 inches (7.6cm) below the bellybutton. Eyes are at final destination and face forward rather than to the sides and reflexes, such as blinking, develop. Ears move to final position and stand out from head. Meconium begins to accumulate in the bowels. Meconium is the product of cell loss, digestive secretion and swallowed amniotic fluid. Fingertips and toes develop the unique swirls and creases of fingerprints and toe prints. Circulation is completely functional. The umbilical cord system continues to grow and thicken as blood travels with considerable force through the body to nurture the fetus. The placenta is now almost equal in size to the fetus. Nerves are being coated with a fatty substance system (myelin) to speed nerve cell transmission and insulate them for uninterrupted impulses. made or used for commercial purposes.